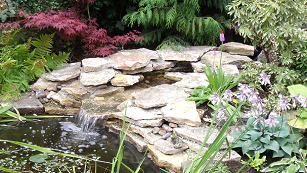 Natural stone waterfall for pond design a garden pond design in Hampshire. This waterfall cascade was designed and built by Water Scenes and is part of a 2000 Gallon koi pond. Water Scenes are a pond and water feature company based in the UK. Each waterfall and cascade water feature is individually built to our customers requirements. Call us today 0800 0232 988 or see our water garden design and installation main page. To see the article in which this picture is featured follow this link waterfalls and natural water features. Water Scenes. - All rights reserved.